Myers’ Cocktail IV Therapy: This extremely popular nutritional IV therapy infusion cocktail is used for the treatment of a wide range of clinical conditions and to enhance your immune system. This is the original intravenous nutritional IV therapy solution, which – for decades years – has benefited hundreds of thousands of people by infusing nutrients and vitamins that are essential to the body directly into the bloodstream. Executive Stress IV Therapy: Higher doses of vitamins than the Myers Cocktail and contains nutrients that are depleted by stress. You will feel energized and improved mental clarity for days afterwards allowing you to re-balance. Hydration IV Therapy (AKA “Hangover Hydration”): Hangover symptoms include headache, nausea, fatigue and anxiety, which are mainly due to dehydration. Our hydration therapy infuses the body with electrolytes and custom vitamins and minerals to restore you to optimal health. Glutathione IV Therapy: The presence of glutathione is required to maintain the normal function of the immune system. Glutathione scavenges free radicals, detoxifies poisons and heavy metals, helps deliver amino acids into the cells, helps in bile production and much, much more. Glutathione is an extremely powerful antioxidant and key to almost all body functions. When glutathione is depleted it results in cell death. When glutathione levels are sufficiently high it protects your cells from damage by free radicals, among other benefits. 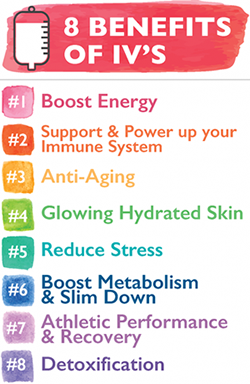 Above all glutathione is extremely important in maintaining a healthy immune system. Glutathione is also very effective in skin lightening / skin whitening when administered at the proper medical grade doeses by our IV specialist. Mood Boost: The perfect pick-me-up! Packed with high doses of Vitamin B, minerals and amino acids, this tremendously popular IV drip with our NYC patients also contains essential nutrients and antioxidants, ideal for promoting general well-being. Weight Loss Boost Nutritional IV Therapy: This cocktail contains higher concentrations of B vitamins, vitamins, alpha liponic acid, trace nutrients, and metabolism boosting vitamins. Designed to kick-start your weight loss regime, our weight loss IV therapy cocktails are designed to expedite the process of natural weight loss, maximize the body’s metabolic rate and burn fat. Cold & Flu IV Therapy: This infusion contains over ten powerful ingredients including Vitamin C, Zinc, Vitamin D, Probiotis and Selenium and will help knock out colds and the flu fast. Mega Detox IV Therapy: Dangerous free radicals and heavy metals such as lead and mercury build up in our bodies over time. They can stifle weight loss and lead to chronic problems like hormonal imbalances. Our Mega Detox IV therapy cocktail helps to facilitate removal of these substances out of your body. B12 Infusion IV Therapy: B12 vitamin deficiencies can cause you to feel fatigued and gain weight. With a B12 infusion you can increase your stamina and improve your metabolism. Adrenal Fatigue – The Depression IV Therapy Booster: A patient favorite! This drip helps with irritability, water retention and thyroid dysfunction. Infused with amino acids and nutrients to help a wide variety of conditions with the added benefit of helping to balance hormones and regulate sleeping patterns. Anti Aging IV Therapy: This cocktail contains age-defying antioxidants provides protection from UV damage, wrinkles, toxins, and dryness. This infusion is high in Glutathione, a powerful antioxidant, which is fantastic for fighting signs of aging and helps keep your skin looking radiant. It contains a range of nutrients to help rejuvenate and hydrate the skin as well as assisting collagen restoration. High Dose Vitamin C IV Therapy: High dose vitamin C is especially useful any time you are under greater than usual amounts of stress, feeling excessive fatigue, when your immune system needs bolstering to fight acute or chronic viral and bacterial infections, when your skin needs to be restored to glowing conditions such as after sun damage or surgery and to help improve the side effects of chemotherapy and radiation therapy like fatigue, nausea and vomiting. Alpha Lipoic Acid IV Therapy: Alpha-lipoic acid is an antioxidant that is made by the body and is found in every cell, where it helps turn glucose into energy. Unlike other antioxidants, which work only in water (such as vitamin C) or fatty tissues (such as vitamin E), alpha-lipoic acid is both fat and water soluble. This antioxidant is known to boost levels of glutathione in our cells. Diet and Detox IV Therapy: Perfect for detoxifying the body. With amino acids such as Arginine, toxins are reduced allowing the body to function more effectively. Also contains digestive aids such as Taurine, which promotes gut health by helping to break down food for more thorough absorption. Immunity IV Therapy: When you are feeling under the weather, our cocktail will give your body the immunity boost it needs. Packed with vitamins B and C, Zinc and powerful antioxidants to strengthen the immune system. Multi-vitamin IV Therapy: This is a fully customized IV therapy offering that is based on your current health issues and well being. The combinations are endless. Trace Elements IV Therapy: Trace elements are chemical elements that are required in minute quantities for the proper growth, development, and physiology of an organism. Trace element are sometimes also referred to as a micro-nutrients. Magnesium & Vitamin B: Magnesium and Vitamin B deficiency can be implicated in conditions such as Fatigue, Fibromyalgia, migraine, muscle spasm, addiction, PMS, and PTSD symptoms. Infusion of Magnesium and Vitamin B can help address deficiencies. A typical magnesium infusion uses 2gm of magnesium or more, a dosage which taken orally would cause severe diarrhea and would never increase the body’s magnesium stores. Therefore, using a high dose infusion to help rebuild the body, while providing an extra for storage, is an ideal way to reduce symptoms and restore health. Zinc IV Therapy: Zinc is an essential mineral that is found in every cell in our body. It has been shown to be involved in over 300 enzyme systems and is involved in a wide range of metabolic activities including collagen formation, wound healing and healthy immune system. Adrenal Fatigue IV Therapy: Adrenal fatigue can cause you to have low energy, hormone imbalances, and a metabolism slowdown. Our adrenal recovery cocktail fights these symptoms with a full spectrum of B vitamins, magnesium, and calcium. Iron IV Therapy: Iron deficiency is the single most common human nutritional deficiency in both developed and developing worlds. Iron is essential for the transport of oxygen to the body’s tissues. Mineral Replenish IV Therapy: Fortify your body’s natural defenses by restoring the key minerals it needs to be healthy and energized. Folic Acid IV Therapy: A must if you plan on getting pregnant (or if you are pregnant). MSM IV Therapy AKA “The Workout Recovery Infusion”: MSM works as an anti-inflammatory and an antioxidant. This highly valuable nutrient plays an important role in building healthy cells so if you are suffering from low levels of nutritional sulphur, the impact on your body as a whole will be great. The production of hormones, enzymes, antibodies and antioxidants all depend on MSM and it is used and expended by the body constantly, meaning that supplies need to be continually replenished otherwise the body becomes deficient. MSM is a nutritional sulphur that is found in dairy products, fruits and vegetables, grains and meat. Largely due to modern day food processing, many people are found to be deficient in this valuable nutrient which is where intravenous therapy steps in. Menopause IV Therapy Relief: This cocktail contains a variety of antioxidants and is one of the most effective vitamin injections for menopause-related concerns, including hot flushes.